Below is the complete exhibition text as it appeared on the walls of the exhibition. “National identity has been one of the most prominent topics of Hungarian public discussions for more than two centuries now. Questions appear in numerous works of art, particularly after the birth of Historicism, the last great consistent stylistic trend of Romanticism. In the first part of the 19th century, in the so-called Reform Era, in the wake of German treatises on the character of nations, Hungarian national character also became the subject of various academic discussions. The time of the Millennium (1896) and the decades following the loss of Hungarian territories in the First World War witnessed the resurgence of these debates. The subject was more influential than ever: hundreds of articles were published on the questions concerned. The different approaches quickly separated: whereas the 1937 special issue of Szép Szó entitled Mi a Magyar most? (What is Hungarian now?) attempted to conceptualise the question of national identity mainly from the perspective of the political left, in 1939 the volume edited by Gyula Szekfű entitled Mi a Magyar? (What is Hungarian?) took account of the possible answers from a conservative point of view. The first book included articles by such prominent Hungarian intellectuals as Attila József, Pál Ignotus and Ferenc Fejtő, while the second featured writings by equally influential figures such as Mihály Babits, Zoltán Kodály and László Ravasz. The present exhibition at Kunsthalle regards both traditions to be essential points of origin. The displayed works do not serve as illustrations of the fundamental questions of national identity or national fate, but rather create a general picture of the different ways art may represent various possible approaches to these issues. What is Hungarian now? The restoration of Hungarian democracy in 1990 after decades of communist dictatorship, the country’s joining the European Union, and the recent economic crisis have made these questions timely once again. The present exhibition does not intend to give definite answers: our aim is to give a comprehensive survey of contemporary artistic reflections on this topic for the first time in its history. The collective memory of most nations preserve heroic figures and legendary stories form an ancient past. Usually these have a widespread influence, in spite of the fact that their historical truthfulness cannot be accurately ascertained. Most medieval chroniclers considered it to be important to record not only contemporary events, but legends of origin, and exemplary, miraculous stories supporting people’s faith as well. The legend of the White Stag, the myth of the bird Turul or Hun-Hungarian kinship have always been significant parts of Hungarian historical consciousness, even though academic historicism never considered them to be credible sources. A considerable proportion of laymen interested in these stories are convinced that these legends of a faded past originate from historical events. As a result, these legends about mythological or historical figures easily become parts of a collective historical or literary tradition, and often affect contemporary Hungarian identity as well. The works exhibited in this section reflect these issues. Hungarian identity and Hungarian destiny as a problem have been primarily passed on in the course of history through texts. Its development from the advices of King Stephen through the works of medieval chroniclers to contemporary treatises constitutes an immense tradition, which is as difficult to comprehend as it is unavoidable. The various writings concerning Hungarian national character amply illustrate the way of thinking of the given period’s cultural and social elite, which was often integrated with specific political programs. The idea of being a “chosen nation” and the consequent responsibility can be identified almost from the earliest pieces on. The quotations placed in the “text-box” here are from various works written in Hungarian between the late 18th and the late 20th centuries. For their authors the necessity to reckon with these issues was self-evident. Within the perspective of the present exhibition, the expression prejudice is meant to refer to simplistic, ready-made, stereotypical images that are usually based on exaggeration. Though most people are aware that stereotypes – due of their schematism – hamper thinking, they have to be accounted for because of their importance as socially transmitted categorical tools. It is clearly a stereotype that Hungarians are reserved, determined, sorrowful and resolute rebels. However, the opposite of this picture is also a common prejudice, and, what is more, being contradictory is also a widespread cliché (as crying through tears, for example). 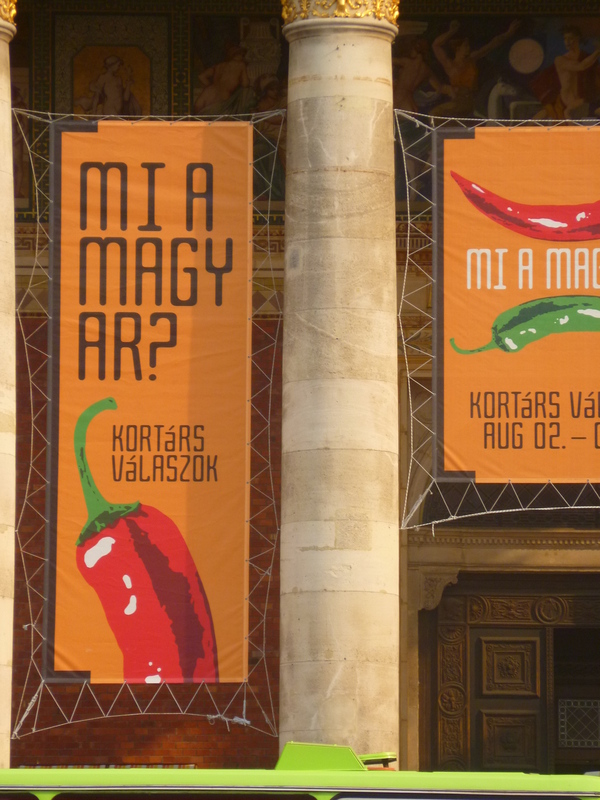 Even one single motif may turn into a stereotype, as paprika, which can also refer to Hungarians’ “spicy,” poignant language. In case of works that belong to artistic trends that focus on the typical, the resulting patterns often became illustrative content-elements, especially when they were not overwritten by ideological or political influence, as in case of socialist realism. This is a common phenomenon in contemporary art as well; however, in the present section one finds works that relate to prejudices concerning Hungarian national character in a reflexive way. Social roles within ethnic communities are ultimately based on the value system of the given community. In case of contemporary Hungarians it may be revealing to identify the kind of figures that this society recognises as heroes: discovering the stereotypical roles entrenched in communities of any size may be most informative. The social value of any particular role is also significantly influenced by its relationship to the virtual world (television, internet, film), which constantly represents and recreates our contemporary heroes. The correspondence between the two worlds is far from being clear, and sometimes it is utterly impossible to discern: virtually produced social roles often appear distorted or false. Art reflects primarily these issues, but through these one may also glimpse at the way art represents the imbalance of social values, the daily injustices of a community and the situation of people pushed to the margins of society. This is a kind of critical position, which the exhibiting artists usually season with a lot of irony and self-irony. East and west, Kurucz and Labanc, folk and urban – the main conflicts of Hungarian society, which do not only cause tensions but may even become disruptive, have been easily discernible and well-documented for several centuries now. As such outstanding Hungarian poets as Arany, Ady, Babits and Kosztolányi have so vividly described, this duality goes back not only to differences of value systems, but also to diversities of general mentality. According to this perspective, the infamous pessimism of Hungarians does not necessarily stem from despair, but rather from the inner struggles of the soul. 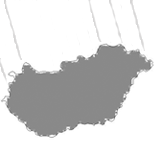 This secret, agitating force arising out of the tension between conflicting opposites can be presented in much more intensive ways by art than it can ever be experienced by any particular person: according to the picture drawn by artists, the air of Hungary feels plainly “deadly” and agonizing. These conflicts do not only tear apart the soul of the individual or the artist: they also penetrate everyday life. One may witness unbearable tensions in the fields of both politics and culture: a number of decisions and choices seem to follow the logic of one of the two uniquely Hungarian parties. It is like being constantly forced into trenches. In the artistic representations of the last three hundred years the dominant colours depicting the nation’s character are typically dark. Contemporary works colour this gloomy tradition of representation with the sometimes playful, sometimes strident tones of irony, which may eventually even help us laugh about ourselves. One’s relation to moral values and basic norms of behavior are determined to a high degree by one’s identity. Social identity is based on national identity, which shapes people’s social norms and standards of behaviour through the community’s shared traditions, memories, symbols and language. It is natural that only a small part of this great gift is actually applied by individual people. From this point of view, one can also distinguish the national identities of Hungarians living abroad, or Jews and Gipsies living in Hungary: double or multiple affiliations are characteristic forms of Hungarian national identity. In this sense, being Hungarian is not a question of ethnicity. As I noted in my previous post, while the thematic conceptions set up national identity in terms of two historically clashing viewpoints, the exhibition text is neutral to the point of meaninglessness. This entry was posted on November 5, 2012 by linnea8 in Other.